Winter, Spring, Summer or Fall - Wow, what a place!! Sit on the huge deck only a few feet from the water's edge and watch the boats sail in front of you or the swans quietly paddle on the pond to your right. Go sailing in the morning, swimming at the beach in front of the house in the evening or drive to the nearby Casinos only 30 minutes away for world famous entertainment and gambling. Boston is about 1 1/2 hours away in one direction and New York City about the same in the other. Bring your boat and anchor in front of the house! Sail, hike, bike, golf, run, swim or just relax in the house on 1/4 of an acre next to the ocean. A great place to see the fall colors or skate on the nearby pond, which freezes in the winter. Very romantic, very quiet, but close enough to the action if you want to get there! We are family of six with four kids under 12 years old. We use this great house for our annual two week summer vacation and have since the kids were born. We spend the entire year hearing 'when are we going back to the 'Red House'?' This might not seem unusual but we live in San Diego California which is beautiful and despite that the kids cant wait to go to the Red House every year to enjoy the neighborhood and all there is to do at this fabulous location. This is a GREAT house and area for you and your family to create memories like we have over the years! Huge Deck, Huge Yard, Great Views of Ocean & Adjacent Pond. This house sits on 1/4 of an acre with great views all around. overall very nice property and location but it can get a bit musty inside. This was the perfect place for our family to stay while visiting with family in the area. The house itself is well maintained and in a great location. The beach was very close. We were really close to many different things to do. The only complaint we had was how quickly the hot water ran out and the fact that there wasn't a vacuum. But both of these things would not deter us from staying here again. We were so lucky to find this place and hope to return next summer. communication with the owners was good and we found the house in good condition with everything we needed. Location is great with wonderful views and easy access to beach and ocean for kayaking. would rent here again. Me and the family had a great time at the RED HOUSE. Great place for small kids to explore and be in a safe and friendly environment. The owners were a great host and had neat things at the cottage for us to do such as local puzzles, games, and more...we look forward to our next stay!!! This house is unique in its location. 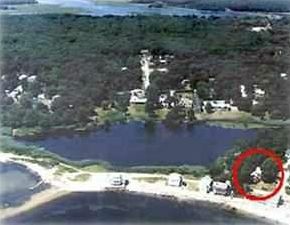 It is located on a tree covered lot with fabulous views of the ocean and a nearby pond. It is truly a magical place that will create great memories for you and your family and friends. Come enjoy this great spot. This house is located 30 minutes from world class casinos if you want to get to the action. Check in 4:00 p.m. on arrival date. Check out 10 a.m. on departure date.